This interesting painting, held in the archive at Bruce Castle Museum, depicts the scene in front of Devonshire Hill Farm looking eastwards along Devonshire Hill Lane (formerly Clay Hill) towards River House (Update No. 34) in the background. The roof of Devonshire Hill Cottage (Update No. 42) can be seen to the left of the painting. towards New River House, 1998. 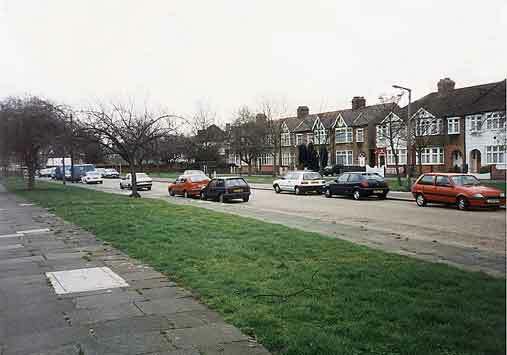 The western end of Devonshire Hill Lane had been developed with private housing whilst the area around the eastern section, together with White Hart Lane, was the site of a large Local Authority Estate (see Update No. 41). The terrace of six houses, initially called River Terrace, to the left of the photograph, were built by South Brothers for Samuel South(2) in 1927 on part of the garden of River House. The remaining garden land to the right of this terrace was sold by Samuel(2) to D. Petitt & Sons, builders, who erected a further terrace of 7 houses in 1934. River House was demolshed in 1937. 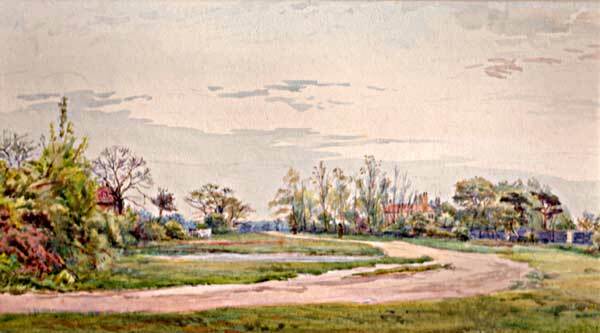 Despite the residential developments, however, vestiges of the manorial heritage of the land continues, with the wide grass verges on either side of the lane, shown in the painting, remaining until today. The tract of land upon which River House stood, and extending to the original route of White Hart Lane (now Compton Crescent), was in the ownership of the Manors of Tottenham and leased as copyhold until it was enfranchised in 1881. This enfranchisement did not include the waste lands of the Manor. Manorial waste comprised those lands, typically the verges alongside roads and lanes, which did not produce rents for the Manor. In Devonshire Hill, the waste remained with the Manor. Although copyhold tenure was abolished by the Law of Property Act, 1922, nevertheless, the ownership of waste land appears to have remained with the Manor, presumably, because there was no copyhold tenant to be enfranchised as freeholder, but the Local Authority acquired an equal interest. The minutes of the Tottenham District Council record that, in March 1921, a letter had been received from H. S. Couchman, agent for the Lord of the Manor, reporting an approach from Mr. South (Samuel(2)) "who desires to acquire the strip of manorial waste abutting on to his ground adjoining River House on the South side of Devonshire Hill Road". The agent invited the approval of the Council to the sale of the waste land at a purchase price of £191, calculated at a rate of £500 per acre, of which the Council would receive one half. In the event, the Council declined to dispose of their interest in the land. During the 1920s, Tottenham Council Housing Estate (Update No. 41) was built in four phases comprising 762 houses together with supporting infrastructure. New roads were built and existing roads, including Devonshire Hill Lane, were improved. In 1929, the Local Authority purchased the interests of the Lord of the Manor in all of the waste lands at the western end of Devonshire Hill Lane including the strip previously sought by Samuel(2). In 1939, Mr. S. Court, of 159, Devonshire Hill Lane, wrote to the Council enquiring whether the residents of the houses abutting the former waste lands could be permitted to purchase the land for the purpose of erecting A.R.P. [Air Raid Precaution] shelters. The Council informed Mr. Court that they were not prepared to sell the land. The Local Authority continues to maintain the land which was known to the local residents as "The Green". Local children found the open space to be a useful play area although, at one time, a notice board admonished "No Ball Games". 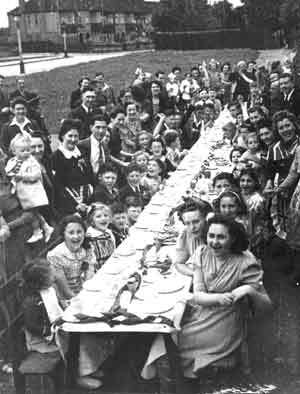 "The Green" was put to good use in 1945 when the local residents organised a street party to celebrate V.E. Day.